Notice: Click the highlighted text throughout this page to display a helpful pop-up image. This document is here to describe the types of monitoring solutions available, as well as here to help you understand which monitors and alarms are compatible with each other. There are two main points to consider when choosing a new monitoring system. First you have to decide which type of monitor you want to use, and then choose the correct alarms that are compatible with that monitor. In all references on this website, “monitors” are the component that makes visual and audible alerts for the nurse to see/hear. There are several types of monitors to choose from. First you have to ask yourself if you want a local monitor or a central monitor. Wireless Monitor – Wireless local monitors can be mounted in the hallway outside of the room so as not to disturb the patient/resident when the monitor goes off. Mounting the monitor in the hallway also allows the volume of the alert to be turned down, making for a quieter facility. Wired Monitors – Wired local monitors will have a cord running from the alarm to the monitor. Our wired monitors come with a range of features: basic alarm monitoring, change pad indicators (for bed and chair pads), recordable voice alarm, and auto-reset capabilities. View feature comparisons. Our central monitors allow you to monitor all of your residents from one central station. All central monitors are wireless. The type of central monitor you choose solely depends on how many residents and alarms you need to monitor. EconomyCare+ Central Monitor - Has 30 alarm channels with 200 ft. range. Monitor up to 30 residents or have multiple alarms for each resident.View compatible monitors. • Extend usable range with signal repeaters (aka. “signal bumpers”). • Optional interface for nurse paging system with 1-mile range, LED alarm display board for nurse station. • Custom programmable room numbers for display on central monitor. 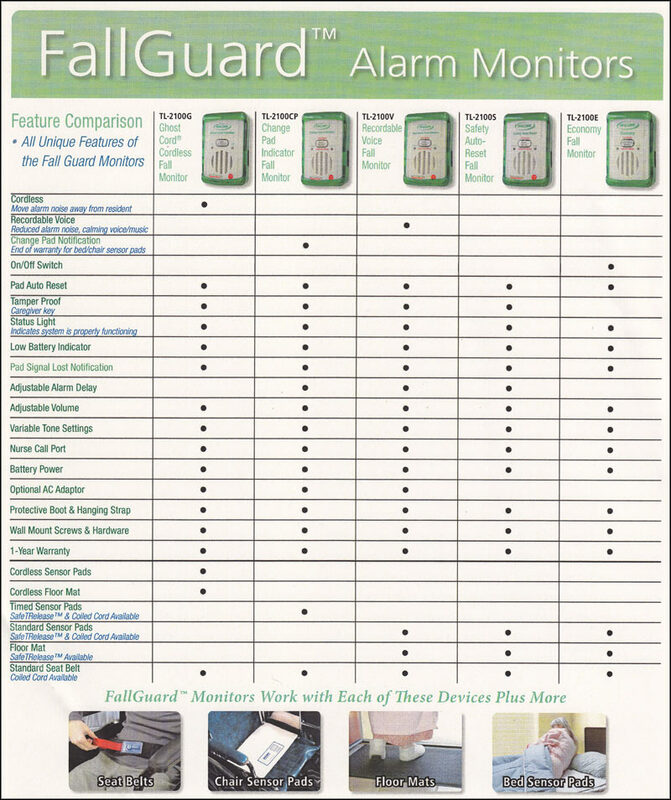 Alarms, as referred to on this website, are the devices that alert the monitor to go off. This can be a range of devices including call buttons, pressure pads, floor mats, motion sensors, seatbelts, and more. However, there may be several types of each alarm that work with different monitors. If you know which type of alarm you need, here you can find out which monitoring solutions are available for that alarm. If you only need a couple call buttons, such as for your elderly parent at home, you can get this kit. It includes 2 call buttons and 1 caregiver pager. Wireless. Wear as pendant or attach to headboard/wall with included mount. This nurse call button works with the EconomyCare+ Central Monitor, which monitors up to 30 alarms. The Bedside Call Button with Cord (#TL-2016NC) plugs into the wall-mounted transmitter (#TL-2016), which alerts the EliteCare+ Central Monitor. The EliteCare+ Central Monitor will monitor up to 999 alarms. Pad numbers listed below will work with FallGuard line of wired local monitors (TL-2100E, TL-2100CP, TL-2100V, and TL-2100S. These will not work with the GhostCord wireless local monitor, TL-2100G. The pad numbers listed below will work with the GhostCord local monitor (TL-2100G) as well as the EconomyCare+ central monitor (433-CMU). GBT-RI – Pressure Pad for Bed – 10” x 30”. Includes transmitter. GBT-WI – “Extra-Wide” Pressure Pad for Bed – 20” x 30”. Includes transmitter. GCT-WI – Pressure Pad for Chair – 10” x 15”. Includes transmitter. FMT-07C – This floor mat will work with the GhostCord local monitor (TL-2100G) as well as the EconomyCare+ central monitor (433-CMU). Includes transmitter. Motion Sensor with Alarm (TL-2700) – Has an alarm inside of it, so it does not require any additional monitoring devices. Motion Sensor and Receiver (TL-2800) –Sends a signal to the included monitor, which can be mounted to wall or desk. Motion Sensor and Pager (TL-5102MP) – Sends a signal to the included pager. 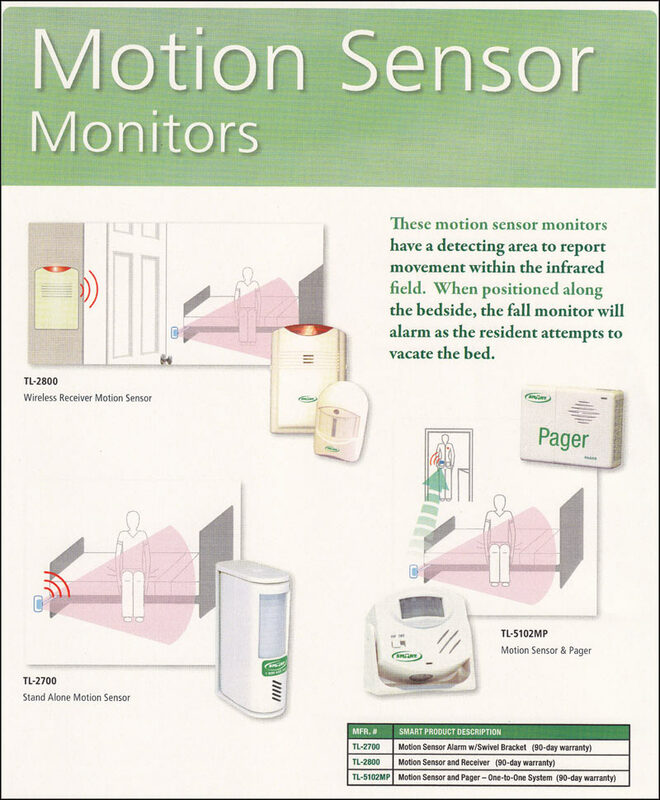 EconomyCare+ Motion Sensor (433-MS) – Programs into the EconomyCare+ central monitor, which monitors up to 30 alarms. Some facilities by law are required to have a pull-cord style alarm located in bathrooms, showers, steam rooms, Jacuzzi, and pool areas. Pull Cord w/ Reset Button Combo (2007CB + 2007RB) – This alarm is compatible with the EliteCare+ central monitor. The EliteCare+ central monitors up to 999 alarms. The early warning seatbelt works with the FallGuard line of wired local monitors, including TL-2100E, TL-2100V, and TL-2100S.